Downtown Crossing is the retail shopping district in Boston located at the intersection of Washington, Winter, and Summer Streets. The photo above is looking north on Washington Street, with Winter Street on the left, and Summer Street on the right. This bustling intersection was at one time so popular that William Filene labeled it The Hub of the Universe. Even today, at lunch time especially, this area is crowded with people. Washington Street, from Temple Place to Franklin Street, is a pedestrian mall, with only emergency and delivery vehicles allowed access. At noon-time, thousands of people cross Washington Street each day, on their way to restaurants, stores, specialized services like financial planning or legal advice, or to government offices like the State House or City Hall. The eminent store at Downtown Crossing is Macy's. Filene's Basement was recently closed and had been located in the basement of the historic 426 Washington Street building, and was the very first location of this retail chain. The Corner Mall is opposite Macy's on Winter Street, and hosts a food court and several retail stores. 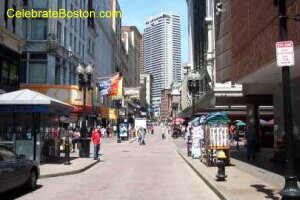 Downtown Crossing is the home to stores that specialize in jewelry, drugs, health and beauty products, accessories, books, music, videos, cell phone services, banking services, and several pushcart vendors. If you enjoy crowds, this can be considered one of the most bustling intersections in Boston during weekdays, and is a popular shopping area. Please note that most stores in Downtown Crossing close early, as the area caters to commuters that work in downtown Boston, and then drive or take the subway home at the end of the business day. Of historical interest, Downtown Crossing once hosted the rival department stores Filene's and Jordan Marsh (much like Macy's and Gimbel's in New York City years ago). The Filene's Store had at one time a real zoo on its rooftop, and each December Jordan Marsh hosted Enchanted Village, which was a simulation of a small town on Christmas Eve. Other famous stores long gone are Raymond's near Franklin Street, and Kresge's near Temple Place. Walking Directions: Exit the station, and you are at Downtown Crossing. From Park Street Station on the Green & Red Lines, walk one block east down Winter Street.